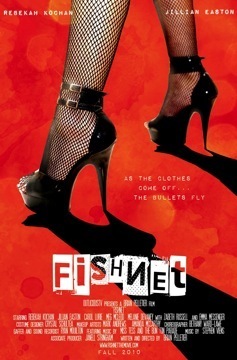 Fishnet - The debut feature film from Brian Pelletier. When successful burlesque dancers Trixie (Rebekah Kochan, Eating Out) and Sulie (Jillian Easton) witness a mob hit in LA, they cut and run to Texas. Staying with Sulie’s conservative parents and posing as roommates, the couple start a troupe and turn this small town upside down. Slapstick and silliness prevail as they fend off the mob, become more famous than ever, and try to keep their relationship secret. It all has to come out eventually. As the clothes come off the bullets fly.